Found in FNA Volume 19. Treatment on page 493. Mentioned on page 492. Perennials, 6–65+ cm (usually rhizomatous, sometimes stoloniferous). Stems 1(–4), erect, simple or branched, densely lanate-tomentose to glabrate. Leaves petiolate (proximally) or sessile (distally, weakly clasping and gradually reduced); blades oblong or lanceolate, 3.5–35+ cm × 5–35 mm, 1–2-pinnately lobed (ultimate lobes ± lanceolate, often arrayed in multiple planes), faces glabrate to sparsely tomentose or densely lanate. Heads 10–100+, in simple or compound, corymbiform arrays. Phyllaries 20–30 in ± 3 series, (light green, midribs dark green to yellowish, margins green to light or dark brown) ovate to lanceolate, abaxial faces tomentose. Receptacles convex; paleae lanceolate, 1.5–4 mm. Ray florets (3–)5–8, pistillate, fertile; corollas white or light pink to deep purple, laminae 1.5–3 × 1.5–3 mm. Disc florets 10–20; corollas white to grayish white, 2–4.5 mm. Cypselae 1–2 mm (margins broadly winged). 2n = 18, 27, 36, 45, 54, 63, 72 (including counts from Europe). Phenology: Flowering late Apr–early Jul (south), mid Jul–mid Sep (north). Greenland, St. Pierre and Miquelon, Alta., B.C., Man., N.B., Nfld. and Labr., N.W.T., N.S., Nunavut, Ont., P.E.I., Que., Sask., Yukon, Ala., Alaska, Ariz., Ark., Calif., Colo., Conn., Del., D.C., Fla., Ga., Idaho, Ill., Ind., Iowa, Kans., Ky., La., Maine, Md., Mass., Mich., Minn., Miss., Mo., Mont., Nebr., Nev., N.H., N.J., N.Mex., N.Y., N.C., N.Dak., Ohio, Okla., Oreg., Pa., R.I., S.C., S.Dak., Tenn., Tex., Utah, Vt., Va., Wash., W.Va., Wis., Wyo., Mexico, Eurasia. 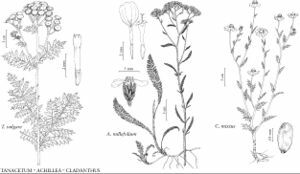 Achillea millefolium is morphologically variable and has been treated as either a single species with varieties or as multiple distinct species. At least 58 names have been used for North American specimens. Some early workers (e.g., J. Clausen et al. 1948) thought the native North American plants were taxonomically distinguishable from introduced, Old World plants. Other workers (e.g., R. J. Tyrl 1975) have treated A. millefolium as a cosmopolitan, Northern Hemisphere polyploid complex of native and introduced plants that have hybridized, forming diploid, tetraploid, pentaploid, hexaploid, septaploid, and octoploid plants and/or populations constituting a single, variable species. An ecomorphotype adapted to the Athabasca sand dunes of northern Saskatchewan has been known as A. megacephala or A. millefolium var. megacephala and has been treated as a taxon of special concern in Canada (V. L. Harms 1999).